Today President Mubarak seems to have decided to crack down on the democracy movement, using not police or army troops but rather mobs of hoodlums and thugs. I’ve been spending hours on Tahrir today, and it is absurd to think of this as simply “clashes” between two rival groups. The pro-democracy protesters are unarmed and have been peaceful at every step. But the pro-Mubarak thugs are arriving in buses and are armed — and they’re using their weapons. In my area of Tahrir, the thugs were armed with machetes, straight razors, clubs and stones. And they all had the same chants, the same slogans and the same hostility to journalists. They clearly had been organized and briefed. So the idea that this is some spontaneous outpouring of pro-Mubarak supporters, both in Cairo and in Alexandria, who happen to end up clashing with other side — that is preposterous. It’s difficult to know what is happening, and I’m only one observer, but to me these seem to be organized thugs sent in to crack heads, chase out journalists, intimidate the pro-democracy forces and perhaps create a pretext for an even harsher crackdown. 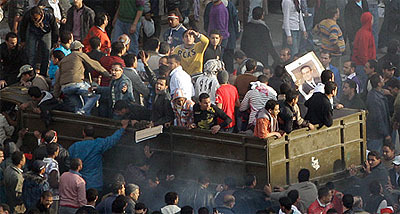 At the White House, today’s events are causing a rapid change in emphasis: Mubarak needs to turn over power immediately. “Now means now,” Robert Gibbs just told reporters. Stay tuned.